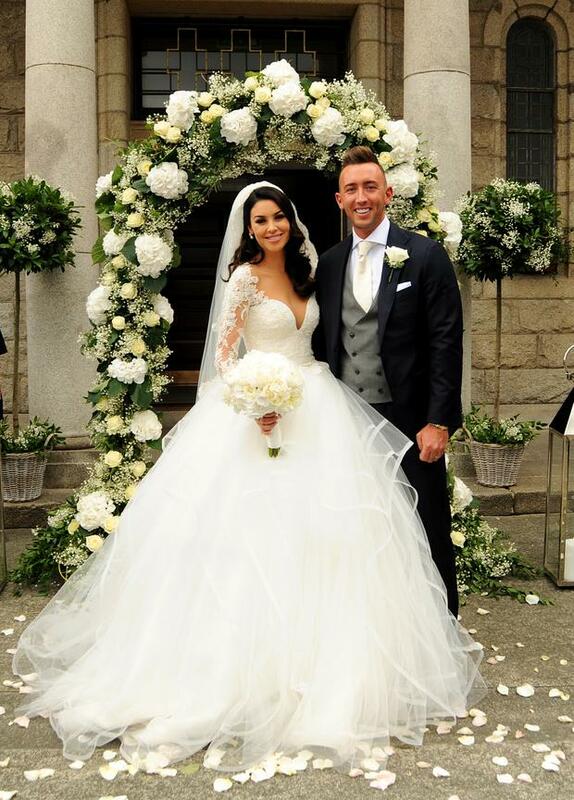 This is the first glimpse of Irish blogger Suzanne Jackson's second wedding dress. Suzanne, who runs fashion and beauty blog So Sue Me, tied the knot with her long-term love Dylan O'Connor in Skerries on Saturday. The bride stunned in a full-skirted gown, custom-designed by Hayley Paige, with a plunging sweetheart neckline and lace sleeves, before changing into a second dress for the wedding reception. While the second gown has been kept strictly under wraps on social media as of yet, celebrity hairdresser Ceira Lambert shared a sneak preview (below) of her outfit change. The picture shows a plunging neckline with lace and embellished detail - although that's all it gives away. Luckily for the wedding party, the rain held off as Suzanne arrived at the church shortly after 1pm in a Rolls Royce just a few minutes late. The luxury transport featured a customised license plate, reading 'Suzanne & Dylan'. Prior to her arrival, a crowd gathered at the church to catch a glimpse of Suzanne's highly-anticipated wedding dress. Her five bridesmaids wore pale pink, full-length dresses with a lace bodice, while her three flower girls wore white dresses. Suzanne (32) entered the church under a floral arch, with her husband-to-be waiting patiently at the altar. The groom wore a dark grey-toned three-piece sit with a grey waistcoat and white tie. The happy couple posed for cameras and the waiting crowd as they exited the church shortly before 4pm. 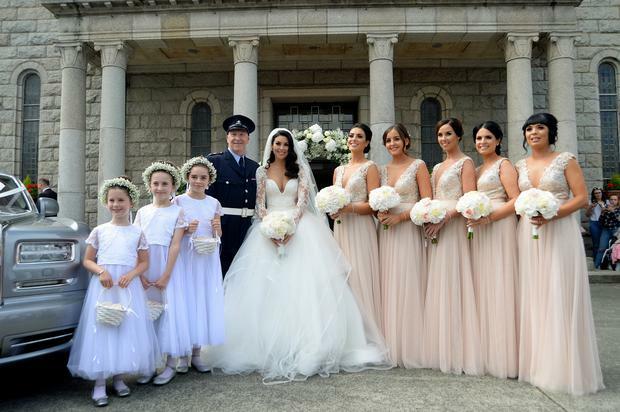 The newlyweds travelled to Powerscourt Estate, Co Wicklow for their five-star reception. Dylan, who works alongside Suzanne in running her blog and beauty empire, popped the question in the Maldives in December 2015. Suzanne entered the blogging scene in 2010 and has established herself as one of Ireland's most prominent influencers and businesswomen, with a best-selling lash line, nail varnish range and contour palette on the market.